Until World War II, Australia thought of itself as part of the British Empire. It was shocked when the British elected to leave the country largely undefended, demanding that Australian troops be sent to fight to preserve other parts of the empire. When the war ended, Australia was forced to confront the fact that it was not an English country at all, but rather a part of Asia. It was hungry to forge its own identity. 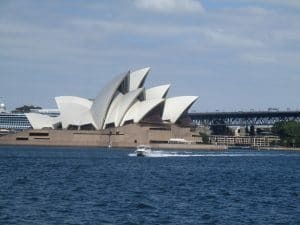 Little did the people of Sydney suspect that a new opera house adjacent to the harbor would become the symbol of that new identity, not only to the citizens of Australia, but to the world. 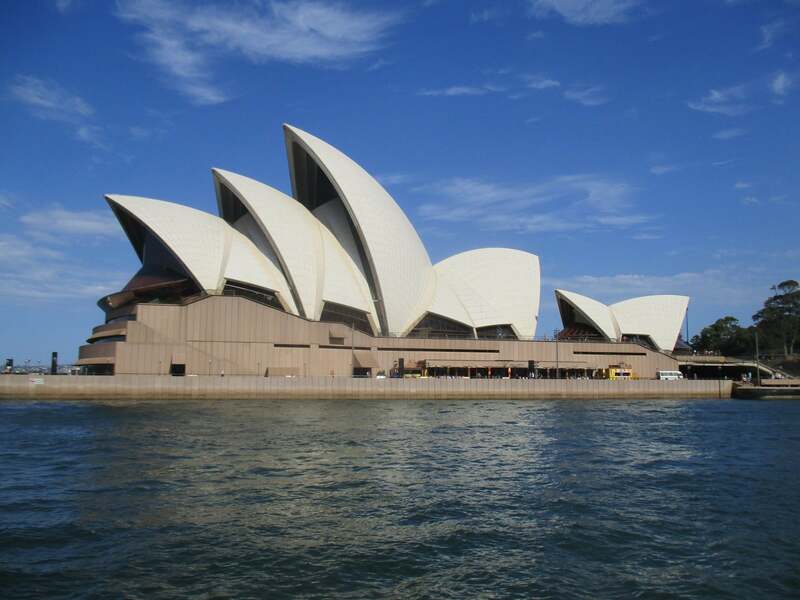 The story of the Sydney Opera House began in 1948 when the head of the Sydney Opera called for a new home for the city’s opera company. A request for proposed designs went out to architects around the world. The Sydney government assembled a panel of 4 internationally renowned architects to choose the final design. One member of the panel was famed American architect Eero Saarinen, who was unable to be present when the selection committee first met. The other three architects took one look at Utzon’s submission and immediately rejected it. Later when Saarinen arrived in Sydney, he asked to review all the submissions, including the ones that had been rejected. 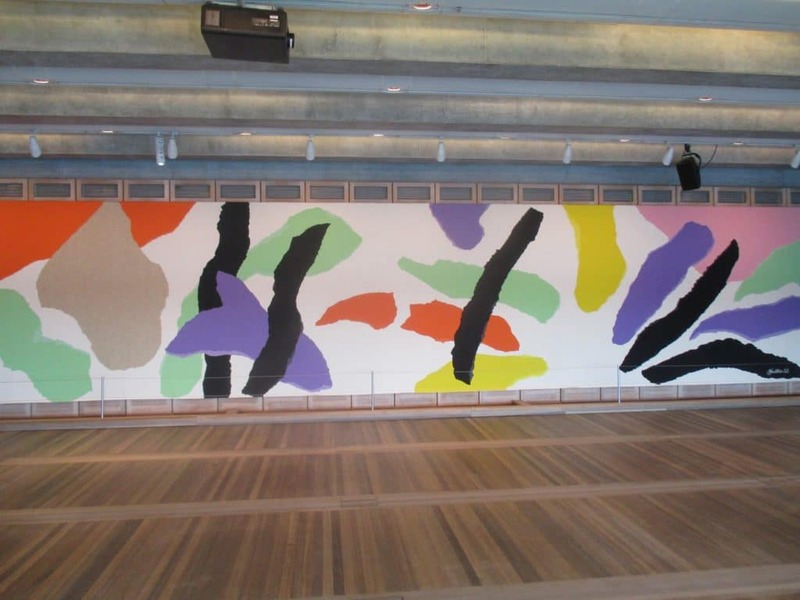 He took one look at Utzon’s design and declared it his favorite. Eventually, it was decided that the ribs to support the roof shells would be made from precast concrete. Each rib was broken into several sections, which were manufactured on site and then lifted into position by cranes. The ribs were hollow, which allowed steel cables to be place inside to give the completed skeleton the structural strength needed. More steel cables were run horizontally between the ribs to hold everything together. 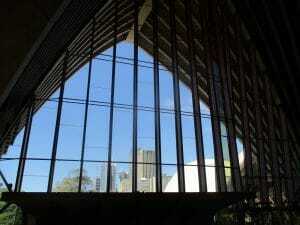 Utzon insisted that there be no openings in the roof — no pipes, chimneys, or cooling ducts. Instead, all the mechanical systems for heating and cooling were mounted beneath the roof and hidden by the ceiling below. 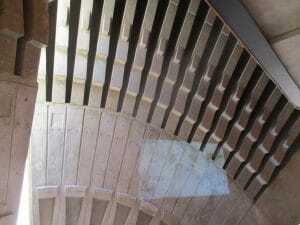 If you know where to look, you can see the subtle openings in the end walls that allow for the entry and exit of air. 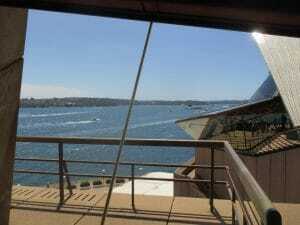 The roofs themselves are covered in ceramic tiles made to Utzon’s specifications. They appear to be bright white on a sunny day, but are actually two shades of light brown, the color of the cotton sails they are designed to emulate. The tiles are self-cleaning, as any dirt or debris is washed away by each passing rain storm. 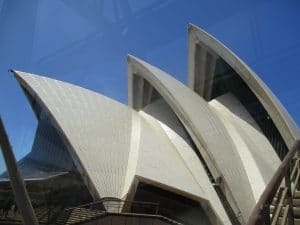 Utzon provided no clues about how to enclose the ends of the multiple shells that compose the various roof sections of the Opera House. The local contractors were left to figure that out on their own. They came up with a combination of steel and glass that resembles the bridge of a ship when viewed from inside. It goes without saying the views of the city and the harbor from within are stunning. See the gallery below.